The campaign centers around Twitter. 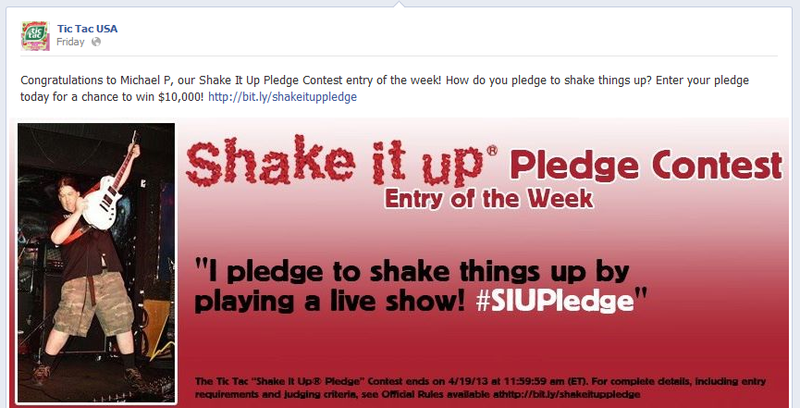 Users are asked to share how they want to shake things up in their lives. 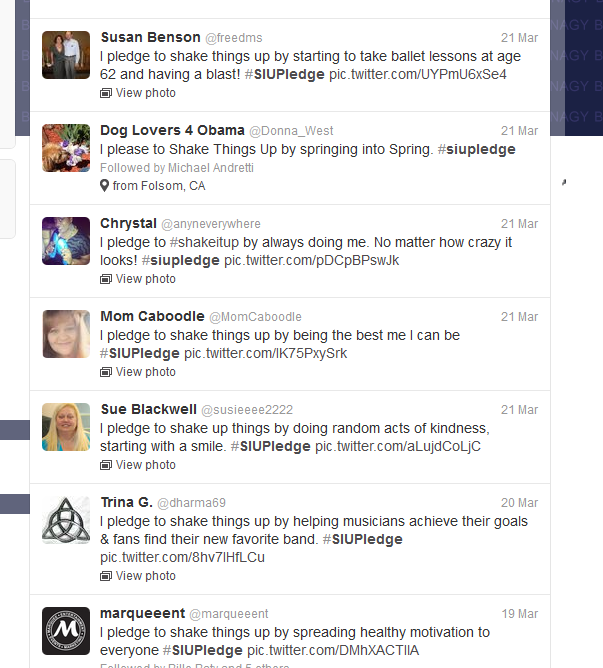 Via the hashtag “#SIUPledge”, users include this pledge in a tweet with the words “I pledge to shake it up by…” as well as an image that illustrate themselves and their promise. At the end of the campaign, Tic Tac will view all entries to determine a winner. The winner is chosen based on a score looking at relevancy to theme, originality of the photo, clarity of the tweet, and the ability of the pledge to actually be completed. A user is also selected weekly to be featured as an “entry of the week”- and shared via social platforms- albeit through some awful graphic design. Despite taking place on Twitter, the campaign’s starting point is actually on Facebook. Via a special section of the Tic Tac Facebook Page, users are introduced to the contest requirements and rules. Once they’ve done this, users must “like” the Tic Tac Page to be taken to a registration form for the contest. Upon completing the form, users are entered into the contest- all they have to do now is share their tweet! 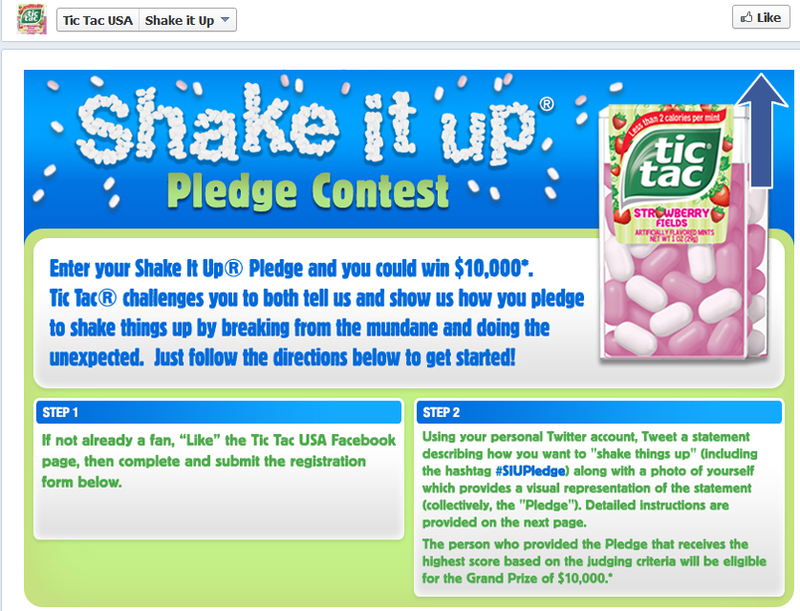 The campaign is promoted heavily through Tic Tac’s Facebook Page and Twitter profile. Multiple tweets and page posts refer to the contest, helping to drive entries. The main item missing is a presence on the Tic Tac website, although it is possible the traffic here is so low it wasn’t worth developing content for. Still, I would enjoy seeing an all-around integrated marketing campaign here.